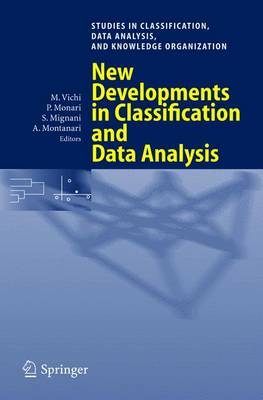 This volume contains revised versions of selected papers presented during the biannual meeting of the Classification and Data Analysis Group of SocietA Italiana di Statistica, which was held in Bologna, September 22-24, 2003. The scientific program of the conference included 80 contributed papers. Moreover it was possible to recruit six internationally renowned invited spe- ers for plenary talks on their current research works regarding the core topics of IFCS (the International Federation of Classification Societies) and Wo- gang Gaul and the colleagues of the GfKl organized a session. Thus, the conference provided a large number of scientists and experts from home and abroad with an attractive forum for discussions and mutual exchange of knowledge. The talks in the different sessions focused on methodological developments in supervised and unsupervised classification and in data analysis, also p- viding relevant contributions in the context of applications. This suggested the presentation of the 43 selected papers in three parts as follows: CLASSIFICATION AND CLUSTERING Non parametric classification Clustering and dissimilarities MULTIVARIATE STATISTICS AND DATA ANALYSIS APPLIED MULTIVARIATE STATISTICS Environmental data Microarray data Behavioural and text data Financial data We wish to express our gratitude to the authors whose enthusiastic p- ticipation made the meeting possible. We are very grateful to the reviewers for the time spent in their professional reviewing work. We would also like to extend our thanks to the chairpersons and discussants of the sessions: their comments and suggestions proved very stimulating both for the authors and the audience.